Cities Connection Project | SOCIAL HOUSING. PLATEAU DE VESSY, VEYRIER. SOCIAL HOUSING. PLATEAU DE VESSY, VEYRIER. At the transition from suburban construction with single family homes to an agriculturally used region, three compact, large scale buildings set themselves apart from the open horizontal lines of the area. The concept of intersecting paths lies at the centre of the planning, while the future project is oriented towards pedestrians. The design adresses all forms of acces to the entire estate – on foot or by bicycle – directly to one’s apartment door. 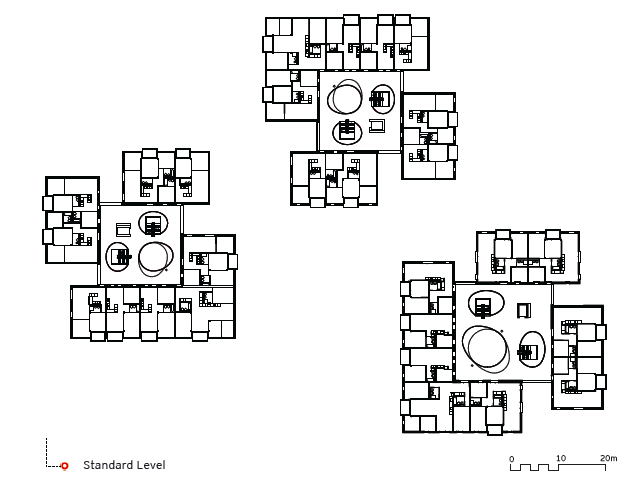 The typological configuration of the building results from the combination of two well-known models – the housing block with a central courtyard, and parallel building units that are accessed via outdoor walkways. These are united in a hybrid type. 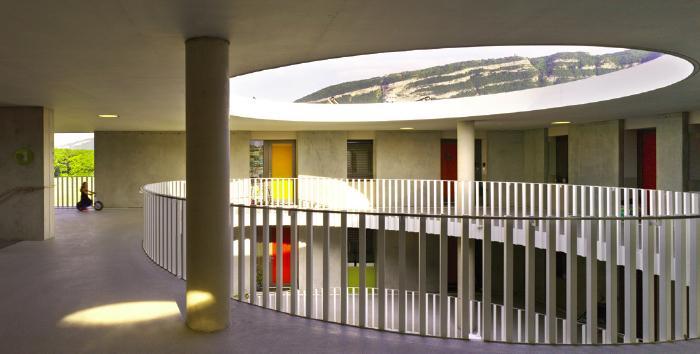 On the individual floors, the barrier-free traffic surfaces allow unhindered access, creating an interim space that opens towards the surrounding landscape and mediates between one’s own apartment and the quarter, as well as creating a meeting place for neighbours in the ten apartments on each floor. These apartments, which are mainly aimed at modest finances, are based on a spatial and constructive module of 3.50 to 10.70 metres. The fragmented form of the buildings combines these modules in various ways – depending on the alignment, the positional angle and openings. In this way, the apartments achieve extremely contrasting results in terms of the floor plans, possible uses and the reference to the exterior. Out of this diversity, highly individual apartment designs are created in the same building.